Throughout human history, many misconceptions arise. Some of these are minor and not worth mentioning, while others are so important that not knowing them could lead to false impression over very significant aspects of human knowledge. One can find below one of the greatest [deliberate or not] misconceptions concerning the theory of evolution. Only by knowing them you can get a better grasp of its meaning. Most of us think Charles Darwin is the founder of the Theory of Evolution. This misunderstanding is so deeply founded in the minds of people that the Theory of Evolution is often called “Darwinism”. That is simply not true. To begin with, It must be noted that the theory that species evolve over time has been said in the philosophers’ circles since the time of the ancient Greeks. Many old Hindu scriptures also mention it. The theory was even postulated by Darwin’s grandfather, Erasmus Darwin. The most important person to mention however is Alfred Russel Wallace. He was the first to formulate a complete theory of species’ evolution and publish it – one year before Darwin did his own. In his autobiography, Darwin mentioned that Wallace theory even helped the acceptance of his own ‘Origin of Species’ from the scientific community! In the years to come the theory went cold. When it was re-discovered after World War II, the scientists did not know their history well and through that Darwin was the one who first established the theory of evolution. Thus, they named it after Darwin alone. 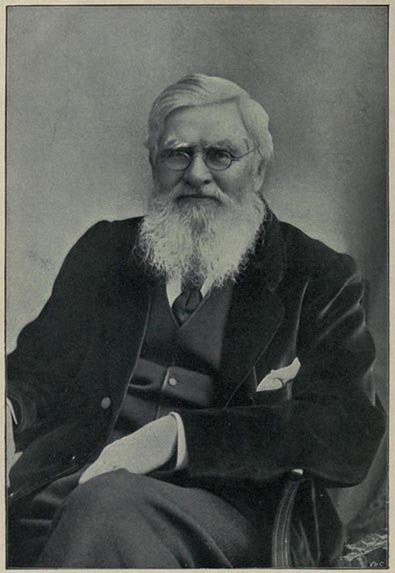 Wallace was elected head of the anthropology section of the British Association in 1866, president of the Entomological Society of London in 1870 and head of the biology section of the British Association in 1876. Wallace sent his first manuscript with his theory of evolution to Darwin for review (!) , without knowing that this act would result in his undoing… Darwin grasped the chance and by using his acquaintances in the scientific community managed to present a draft paper of his own together with the Wallace paper. Darwin said in his autobiography that he had the idea of the theory of evolution for 20 years before that moment. However Wallace also had been thinking of his theory for many years before . Because we can never get into the mind of other people and know what they were thinking, a true researcher of the scientific history should rely on the papers one has the courage to publish. And the puplications history cry out in favour of Wallace. It is well documented that Darwin was NOT the first to get it all together. Wallace had a complete paper published one year before Darwin. He was just unfortunate to have it sent to Darwin himself to review it. That gave Darwin the opportunity to publish in the same convention some notes (I repeat: “notes” and not something complete) where he said the same things that Wallace said. The one who claims to have formed a theory must prove it. So if Darwin claims that he has “thought” of evolution before Wallace, he must provide evidence to support that. Wallace has evidence: the paper he sent to Darwin for publication! If Darwin had thought of evolution so many years before, then he should have more things at hand instead of some “notes” (that he claims – but of course cannot prove – he made before Wallace sent him his paper) he sent to publish with the paper of Wallace. One cannot of course believe the guy who just claims “I have thought of it!” and not the guy who had a full paper published first! Wallace, despite of his spectacular scientific contributions, was actually expelled from the scientific community of his time and died in poverty. Darwin was mentioned more and more as the ‘evolution by natural selection’ theory founder and Wallace less and less. It is characteristic that other naturalists didn’t even want to grant him a pension when he faced great economic problems, because of his ‘spirituallity’ problems. It was only after Darwin’s strong requests that they finally granted that pension. Nowadays, many people attempt to distort the truth about Wallace and build the image of a person who was ‘second’ after Darwin in the theory of evolution field. The reasons behind that are explained in the next chapter. Nowadays many people try to claim that Wallace was one of the greatest supporters of Darwin. That is true, but because Darwin was actually a follower of Wallace’s theory and not the other way around! In a continuous effort to distort the truth, sites that are devoted to Wallace (it is easy to find out which by just searching Internet for Wallace) mention that Wallace was not an advocate of the Intelligent Design theory, even if Wallace himself has written in favour of the existence of a divine creator / designer (see the Important Works of Wallace below). The ‘official’ reason behind the above-mentioned anti-Wallace war is that at the later stages of his career, Wallace begun to be an advocate of Spiritualism. He even participated in seances and really thought that some of the things he witnessed in these seances were real. That was condemned by his fellow scientists. The true reason behind the isolation of Wallace from the scientific community is his beliefs concerning the application of the evolution theory to humans. In his work ‘The Limits of Natural Selection as Applied to Man’ (S165: 1869/1870) , he argues that the theory of evolution cannot explain ‘higher’ human properties. He proposed the existence of a ‘Higher Intelligence’ being to explain such things as the passing of inorganic matter to living matter or the existence of consiousness. That belief was annoyingly opposed to the more ‘agnostic’ (or ‘atheistic’ according to many) darwinian belief of a world without a designer, which was becoming more and more popular among the biology scientists cast (modern molecular biologists like Francis Collins have ‘returned’ to the intelligent designer beliefs – see intelligent design). 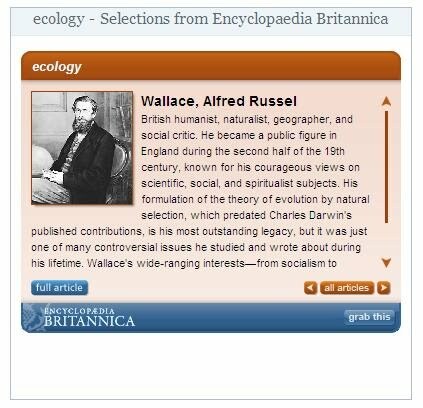 The fact that Wallace was at some point in time Head of the anthropology section of the British Association made things even more embarassing for the atheist-darwinists. So, with the excuse of Wallace’s spiritualism beliefs, the heads of the scientific society buried his work. Some medals and honours on his name certainly cannot explain why Wallace is ‘forgotten’ by todays academies of science. One must bear in mind that the some science academies are full with people who believe more in science than in human. These academies represent an elite cast of people who believe more in scientism than in the noble superior traits of humankind. Having someone in their ranks who did not believe in the non-existence of God and the superiority of science over everything else, could not be tolerated easily. However one must also bear in mind that science academies do not necessarily represent the views of all scientists in their field. They are invite-only closed groups and you cannot easily get an invitation if you do not agree with them first on such matters. However sometimes people of higher intelligence and extreme scientific abilities conquer the castle of scientific dogma and just tell the truth. We must honour them and study their works. DNA. On the edge… Breath in.... Breath out! On December 2008, National Geographic posted an article about Russel Wallace (see National Geographic December 2008 Issue about Russel Wallace). The article presented Wallace as an intelligent naturalist who just happened to sent a paper to Darwin for publication that contained the theory Darwin himself thought of for the past 10 years. The fact of Wallace being the first to publish a paper on the Theory of Evolution via Natual Selection was recorded as a small amusing coincidence. As simple as that. No analysis of the historical context. No need to explain why we consider Darwin who had “thought” of it as “first” and not the one who “published a paper” on it…The article in a ridiculous attempt to overcome the annoying truth, labeled the paper of Wallace a “product of two nights’ hasty scribbling, which followed a moment’s epiphany during a fever”, but without changing the essence of the situation: Wallace had a paper to be published (and in fact it was published), while Darwin had not published anything. According to the article Darwin “had developed [the Theory of Evolution] but hadn’t yet published” – now how one can develop something but not publish it is another question which the article did not attempt to answer . I personally wrote a letter to the National Geographic Magazine (Greek version) in an attempt to restore the truth. The letter was accepted and published one year later. I did not get any reply from the authors of the article. However high ranking people in the magazine told me that they agreed with my position. Anyone who wants a copy of that letter can contact me directly. 1. ‘The Origin of Human Races and the Antiquity of Man Deduced From the Theory ofNatural Selection’, Alfred Russel Wallace (S93: 1864). 2. ‘Notes Added to the Second Edition of Contributions to the Theory of Natural Selection’, Alfred Russel Wallace (S716: 1871). Here’s a challenge for you — You know what Spiros, here’s a challenge: try putting your claims about intelligent design and evolution into wikipedia. Just try it. Then you will experience the full glory of articulate scientific reasoning as it is used by all of the other users to shoot down your perversion of science and reality for religious means.I’m sorry, you are entitled to your views, but you’re attempting to rewrite history and distort science for your own religious motivations. That’s not cool. Too conspiratorial — “Some medals and honours on his name certainly cannot explain why Wallace is ‘forgotten’ by todays academies of science.”I am a zoologist and have always been aware that Wallace and Darwin jointly formulated the theory of evolution by natural selection. 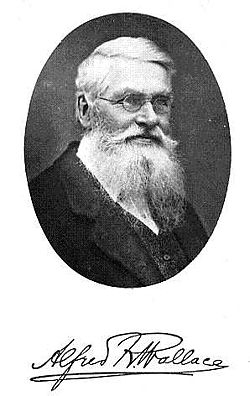 Wallace, in addition, is well remembered for “Wallace’s line”, the “Wallace effect” (niche segregation by reinforcement of reproductive barriers), and many other important contributions to zoology. And, as you say yourself, Darwin quoted Wallace a lot.I cannot check all the details of your story but find it a bit too conspiratorial. Remember the controversy about the discovery of the calculus, Leibniz or Newton. Both!!! Things are sometimes in the air, just waiting to be discovered. (On second thought, Leibniz published his formulation of the calculus, which has become the accepted one, well before Newton, but nobody ever doubted that Newton discovered it independently). Untitled — What i refer to are facts. How they look like is a matter of opinion. Untitled — Unless I’m gravely mistaken, “intelligent design” is a misnomer for divine creation by an intelligence that exists outside the observable universe. Since there has never been a single shred of verifiable evidence produced in support of this religious claim, why should any thinking person give it any serious consideration?There were many scientists that contributed elements to the Theory of Evolution and natural selection, but it is well documented that Darwin was the first person to tie it all together into the cohesive theory that remains universally accepted, verified countless times and largely unchanged to this day. Untitled — Actually the one who claims to have formed a theory must prove it. So if Darwin claims that he has “thought” of evolution before Wallace, he must provide evidence to support that. Wallace has evidence: the paper he sent to Darwin for publication! If Darwin had thought of evolution so many years before, then he should have more things at hand instead of some “notes” (that he claims – but of course cannot prove – he made before Wallace sent him his paper) he sent to publish with the paper of Wallace. I cannot understand how you believe the guy who just claims “I have thought of it!” and not the guy who had a full paper published first! If you publish a paper first and I come and tell people “hey, I have thought of that also 15 years before!”, would you not react?For the “design” comments, I will gladly wait for your comments on my “Religional Science” and “Evolution and Intelligent Design” knols. Untitled — 1. The fact that something is highly improbably does not mean that there must be a ‘design’ (which presupposes a designer). Evolution is not ‘design’, it is a naturally occurring phenomenon.2. It is a widely acknowledged fact that Darwin first documented his theory a full 15 years before finally publishing it. He waited because he was afraid of the backlash and wanted to accumulate an overabundance of positive evidence in support of his theory.You seem to have an extraordinarily different view on scientific history to the generally accepted one and I would like to know your sources and if they have been verified. Untitled — Thanks for the comment.Regarding what you write I must note the following:1. The “design” of the universe is something well documented. For example cosmologists and astronomers have found out that as many as 10 universal variables have exactly the required values for the universe to support life. You can see my “Religional Science” knol (http://knol.google.com/k/spiros-kakos/religion-and-science-unification/2jszrulazj6wq/2#) or the “Evolution and Intelligent Design” knol (http://knol.google.com/k/spiros-kakos/evolution-and-intelligent-design-the/2jszrulazj6wq/3#) for more on that. Whether you accept or deny that “design” notion is mostly a matter oh philosophical stance and not a question of being “religious” or not.2. It is well documented that Darwin was NOT the first to get it all together. Wallace had a complete book/paper published onle year before Darwin. He was just unfortunate to have it sent to Darwin himself (!) to review it. That gave Darwin the opportunity to publish in the same convention some notes (I repeat: “notes” and not something complete) where he said the same things that Wallace said. Now tell me: if you give me a book you have written for review and I suddently come up with exactly the same ideas you have in a “notes” format, wouldn’t that make you think…? Is “natural selection” the final theory for evloution? — I can understand the talk you are mentioning here. Wallance may be a great contribution on “natural selection” But, I’m wonder whether “natural selection” is the final theory for evolution. I don’t think so. What do you think? Untitled — Thank you Sekhar for your introducing interesting Knol article. I’ll read it and append my opinion on your article as soon as I complete my reading. Untitled — I agree with your opinion. We should not overlook other principles in the evolution including the natural selection. Now, my question is about higher levels than the level of the principles.In our general life, we find that evolution and revolution are happened rotationally. Based on my experience, the technologies accepted in a global standard consist of both evolutionary features and revolutionary features. Depending on condition in each time, we select enhanced schemes highly compatible with the current version or fundamentally new concepts compared to technologies containing in the current version. The selection is performed according to either the performance or other metrics. Moreover these two selection events are happened rotationally. In short, any of concepts among evolution, revolution and rotation should not be neglected when we explore the secrete of life. What do you think? Untitled — Spiros,I think that “natural selection” as an explanation to the process of evolution is incomplete. May I request you to see this knol?http://knol.google.com/k/dmr-sekhar/the-drive-and-the-direction-of-evolution/3ecxygf1lxcn2/34#Thanks,Sekhar. Untitled — I understand that you consider “revolution” as the product of free will / free thought, as opposed to natural selection (which is something more like an “established” mechanism that follows rules)? Is that correct? Untitled — I think that natural selection is only a part of the mechanism that can explain biodiversity on the planet. There are many things that point to that direction. For example one cannot overlook the failure of every random process to generate more valuable data. In order for a process like “random mutations” to do that there must be something “more” than just natural selection. Untitled — Interesting ideas. So what do we call a “species”?